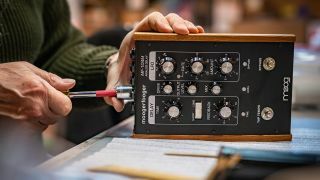 Moog has announced that it has been making a limited supply of the MF-104M Moogerfooger Analog Delay pedal, but will only be selling them from its Asheville store in North Carolina. The limited run owes to the discovery of a small number of the elusive bucket-brigade delay chip. An issue that has caused the delay pedal to be mostly out of production lately, with the last batch being produced in 2015. You can find out more on the MF-104M Analog Delay on the Moog website.